Ghosts of Medium electric poles at the top row, with normally placed ones below. A ghost is a semi-transparent marker for an entity or tile which can be placed as a planning tool for future manual building or for construction robots to place using supplies from a logistic network. A ghost does not perform any of the functions of the object it represents, but exists to mark the spot where the item should later be built or, in the case where an entity was destroyed, the place where it stood. A ghost can store configuration information such as the recipe used by an assembling machine; this configuration will become active when the real entity is placed on top of the ghost. The majority of entities placeable by the player can be ghosts. Exceptions include mobile entities such as the car, tank and robots. Locomotives, cargo wagons, fluid wagons and artillery wagons are valid ghosts but must be placed on rails. Any tile that can be placed by the player is valid as a ghost. The cursor as it appears prior to placing an entity ghost. Single ghosts are placed in the same way as normal entities and tiles: by clicking with Left mouse button on the map. If Shift is held with an item in the hand, the ghost symbol appears. Click Left mouse button will now place a ghost entity or tile instead of the object itself. Under Settings->Interface is the option Pick ghost item if no items are available. If this is enabled a ghost item will be provided to the player whenever they select an item which is not available in their inventory. This affects both the pipette tool (Q) and selecting an item from the quickbar. If the player is using a ghost item and during that the associated item is inserted into to player's inventory, for example by robots, the ghost item will remain in the player's cursor and continue placing ghosts until they manually reselect the associated item. Placing a blueprint will place ghosts for everything contained within the blueprint. When placing rails, the rail planner is a convenient way to place a large number of rails, and is required for placing curved rails. The rail planner will place ghosts when Shift is held at the same time as clicking a rail planner arrow. In ghost mode the rail planner can be used to place ghost rails of any length. Once construction robotics has been researched any entities that are destroyed (for example by enemies) will leave behind a ghost. This allows these buildings to be re-built automatically if construction robots are available in the area. The materials required to build the object are available in the logistic network and enough construction robots are free to begin the placing. The materials required to build the object are available from the player's inventory, the player is equipped with one or more personal roboports and is carrying one or more construction robots. Ghosts that are placed by the player will last forever. Ghosts for destroyed entities will last a week of game time. Their remaining time is indicated by the purple bar below the ghost. The top and middle part of a 3-way railway in "ghost mode". A bunch of ghosts of recently destroyed entities. Trains and wagons can now be blueprinted and therefore can be ghost entities. Added the setting Pick ghost item if no items are available. Increased ghost time to live of ghosts from 1 hour to 1 week. When building a different entity on top of a ghost, settings from the ghost will be copied if possible. 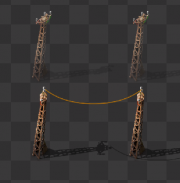 Blueprint previews and ghost entities now have their walls, pipes and belts connected. Manual ghost building will mark trees/rocks for deconstruction. This page was last edited on 16 April 2019, at 05:29.